The Diamond Skid is a superior quality, reliable, complete reverse osmosis drinking water purification system and water delivery system, for use in commercial applications. It contains everything needed to purify and deliver water to the filling source, making it more than just a reverse osmosis filtration system. This full service water purification system is currently used throughout the domestic and international marketplace, answering the call for pure, quality, great tasting drinking water. The Diamond Skid is used in applications such as water stores, bottling plants, water pouch plants, water purification plants, beverage production, pharmaceuticals, and various other applications calling for pure RO water. This TFC membrane reverse osmosis drinking water purification system designed to consistently, efficiently, and reliably produce pure RO water under 10ppm for consumption. This water purification system can also be configured to produce purified alkaline water. The Diamond Skid is available in multiple models to suit different production levels ranging from 1,500 – 9,000 gallons per day. This water purification system can be easily modified for higher production levels at a later date and easily adaptable for various uses. 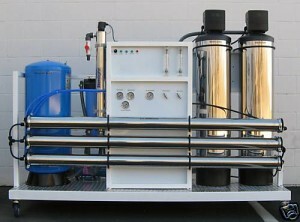 The Diamond Skid reverse osmosis system features a unique design allowing it to be extremely reliable with low maintenance costs. The system is comprised of basic electrical components that are readily accessible worldwide, unlike many other systems made of proprietary parts and microprocessors that are prone to failure. The Diamond Skid reverse osmosis water purification system is built upon order allowing our technicians to customize the system to meet your needs in the most efficient, affordable, and reliable design. Also the system can be tailored to fit practically any application calling for high quality, pure water. The Diamond Skid water purification system is manufactured and assembled in the USA with NSF approved components. The Diamond Skid is made with a locking wheel frame allowing it to be easily moved and repositioned during moving, maintenance, cleaning, etc. The system comes with a 1year warranty on parts from manufacturer defect and continuous phone and email technical support. The Diamond Skid is very user friendly, easily installed, and comes with a complete detailed operation guide including user instructions, maintenance, and installation procedures. STEP 1: AG Pre-Filtration – cartridge type, removes particulate matter down to 20 microns. STEP 2: Carbon – an activated carbon cartridge filter that removes chlorine, chloramine, solvents, lead, insecticides, gasses, and other harmful contaminants. Works as a water softener, without the use of salt and drawing hardness particles together and crystallizing them. Includes an automatic backwashing system. STEP 6: Storage – water is stored in FDA approved tanks. STEP 7: Repressure System – 12 GPM pressure pump assures constant water supply from storage tanks to post carbon filter, ultraviolet sterilizer, and faucets. STEP 9: Post Carbon Filtration – water travels through a 4.5in x 20in coconut shell carbon block filter, polishing it for an exceptionally smooth taste. Please call before ordering with any and all questions regarding the equipment, uses, specifications, installation, or any other questions. We have a very friendly and helpful customer service department that can be reached during normal business hours; Monday-Friday 9am-5pm PST. Also, for best results it is highly recommended to obtain a water analysis test in order to find which contaminants are present in the water supply. Feel free to reference our Water Problems Page or call our Customer Service Personnel for a better understanding of the different contaminants and their effects/consequences.